These tropical natives are strictly grown as annuals on most of the continent, but in our sunny and hot South Florida climate, we have the opportunity to enjoy them year after year in our gardens. 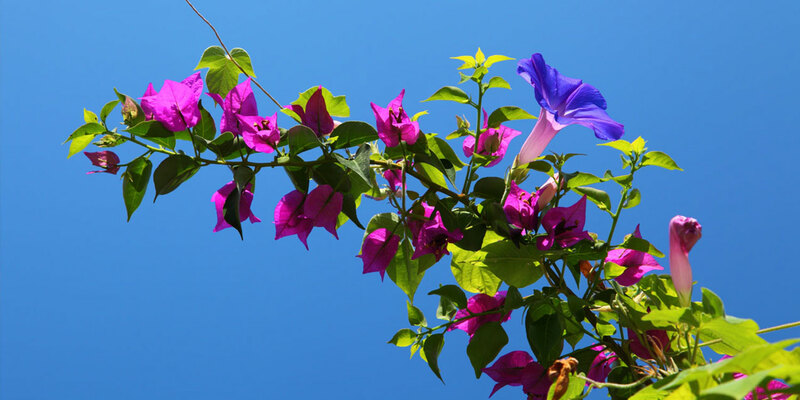 Technically speaking, the bougainvillaea is actually a woody vine, and the flowers are “bracts” (leaves that change color); but what most of us appreciate in our gardens is a stunning plant with gorgeous color that can reach impressive heights after year of growth. Behaving like a shrub, they can grow in a sprawling habit, offering a blanket of color, but more popularly can be supported with a trellis or against a structure to attain heights of 15-40 feet tall! This makes them perfect for covering up a modest fence or growing up the side of a building, where their impressive colors can be best put to use on display. 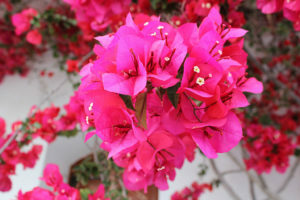 The impressive and colorful “blooms” of bougainvillaea are actually color-changing leaves, like poinsettia plants, a common trait in tropical plants. 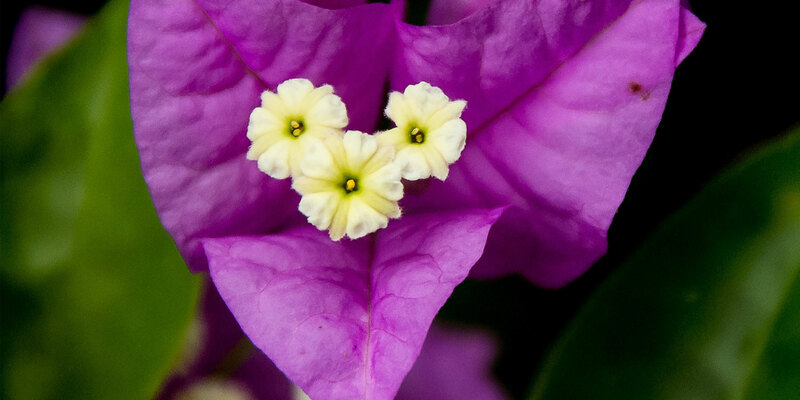 The actual flowers of bougainvillaea are tiny and trumpet-shaped, growing among the bracts in a variety of shades, offering twice the attraction in just one plant. Bougainvillaea are endlessly popular for their remarkably easy maintenance. For such a stunning plant, many assume that they require careful and skilled labor to keep looking their best, but they actually take minimal effort once they are established in a location that has full sun and well-draining soil. While established plants are easy to care for, the transplanting process can require more effort over the short term, babying the plant until the roots set. After about four weeks or careful maintenance, though, your bougainvillaea should be ready to thrive without much more intervention from you! 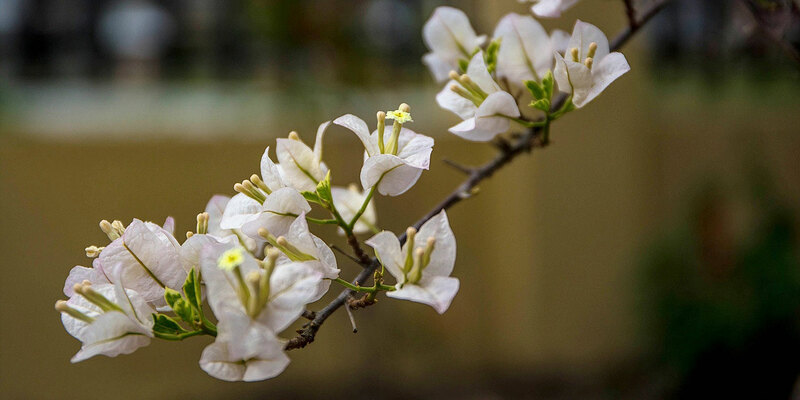 Keep yourself protected with good gloves and protective clothing whenever you work with your bougainvillea, as the thorns can be quite sharp and even cause rashes. Water occasionally, rather than frequently. Don’t worry about being neglectful, as your bougainvillaea will be much happier if not overwatered. Bougainvillaea are popular and stylish for their ability to bring saturated color and style to your yard. However, the best part of this plant is that it is so easy to grow and can quickly become large enough to shape to suit your imagination. A popular choice for a colorful property border, wall-climbing plant, or fence cover, you can easily prune your bougainvillaea to suit the needs and look of your home!